Relax and enjoy your Driver Guide’s commentary as you travel sixty kilometres from Darwin to the Adelaide River. 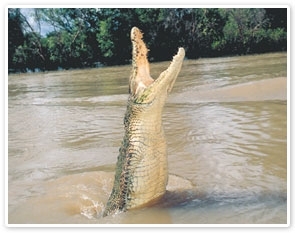 Home to over 1,600 Crocodiles, the ruggedly beautiful Adelaide River is the location of the famous Jumping Crocodiles. Nope, we didn’t ‘photoshop’ the croc’s legs off in the photo above, many of the female crocs are missing limbs from the mating season! Enjoy the banter and stories about the crocodiles from the experts on board the cruise as you watch these prehistoric creatures at close range. After your mini-adrenalin rush of watching crocs snap their jaws just metres away, continue to the Window on the Wetlands Visitor Centre for relaxing views over the Marrakai Plains. Then it’s on to Fogg Dam Nature Reserve to view a wetland ecosystem up-close. Fogg Dam is also a great location to spot birds and other wildlife. The monsoon and eucalypt forest, melaleuca woodland and open water attract a diverse range of birds, reptiles, mammals and marsupials.